Chris Mosier is perhaps the number one person leading the way for an understanding and acceptance of transgender athletes. He has shared on many occasions that by age four he already knew that his gender identity was male in spite of the fact that he was born in a biologically female body. Chris has always been very competitive, someone who never wanted to be a “middle of the pack” athlete. And yet he realized that as a female, he wasn’t competing as his authentic self. 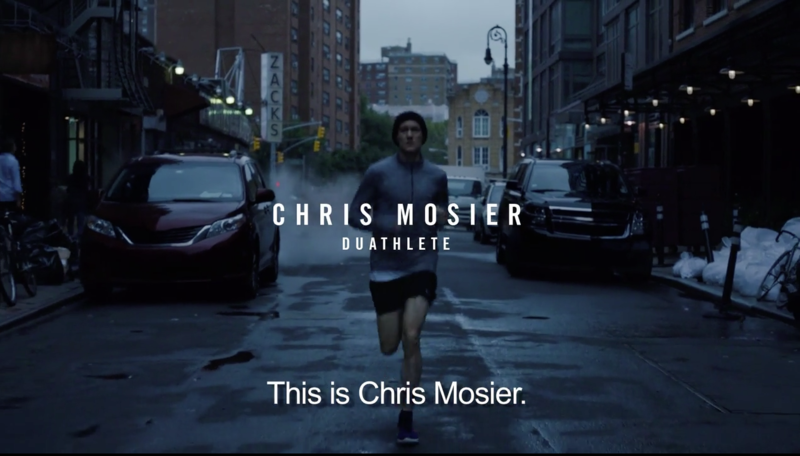 How fitting then that Nike, whose swoosh logo stands for “Just Do It,” has featured Chris in its latest video, “Unlimited Courage” as part of the company’s new “Unlimited” campaign showcasing both everyday and professional athletes who push themselves to the limit. Chris is the first openly trans man to earn a place on a U.S. national team to compete in the 2016 World Duathlon Championship in Spain this past June. But in order to compete, he first had to clear his status with the International Triathlon Union (ITU) who hosted the world championships. Until Mosier made the team, the ITU had used the original International Olympic Committee (IOC) requirements for transgender athletes that included both internal and external surgery. Now, thanks to the newest medical and scientific advancements and Chris’ persistence, the IOC changed its participation rules and it has opened the way for many trans athletes to continue a competitive life. Although Chris isn’t an Olympian since the duathlon isn’t an Olympic sport, he has been an important visible example for other trans athletes who are considering a medical transition. Every day Mosier says he reads the following quote, “Be who you needed when you were younger,” a sentiment that fuels the reason he is willing to be open about his transition. He’s not looking for that elusive fifteen minutes of fame; he’s paying it forward, being the transgender athlete role model he looked for and couldn’t find when he was younger. Being that visible example has also led to Chris being the first openly trans athlete to be part of Sports Illustrated’s 2016 Body Issue. Thanks Chris Mosier, Compete Magazine’s 2013 Mark Bingham Athlete of the Year for your unlimited courage, and to Nike for showcasing the fact that if you can dream it, you can achieve it!